Welcome to Garden Bloggers' Bloom Day for November 2018. 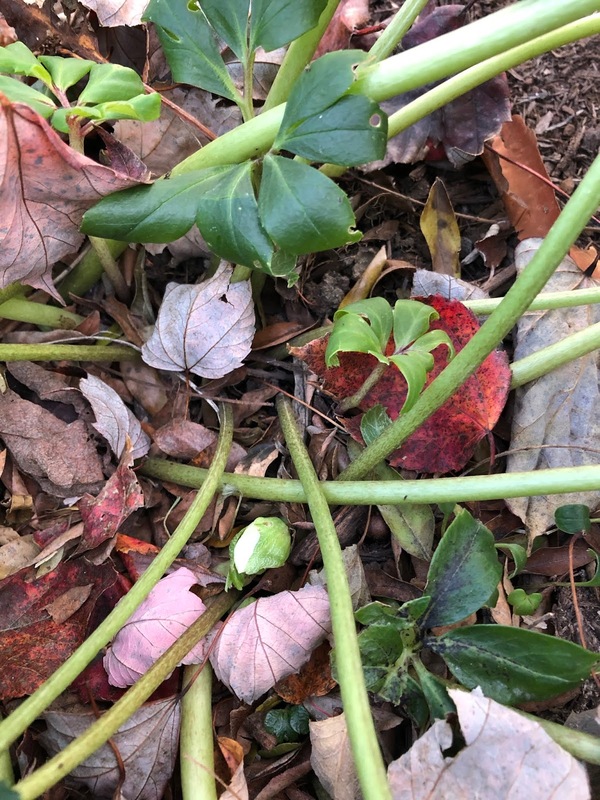 Here in my USDA Hardiness Zone 6a garden in central Indiana, I have a vague recollection of fall which seemed to arrive and depart in a matter of days. We went from "will this summer ever end" to "winter has arrived" with one thrilling weekend of excellent fall foliage color in between. In my garden, which may be snow covered when this posts if you believe the weather forecasters, the last blooms of fall are shuddering in their roots in the cold. 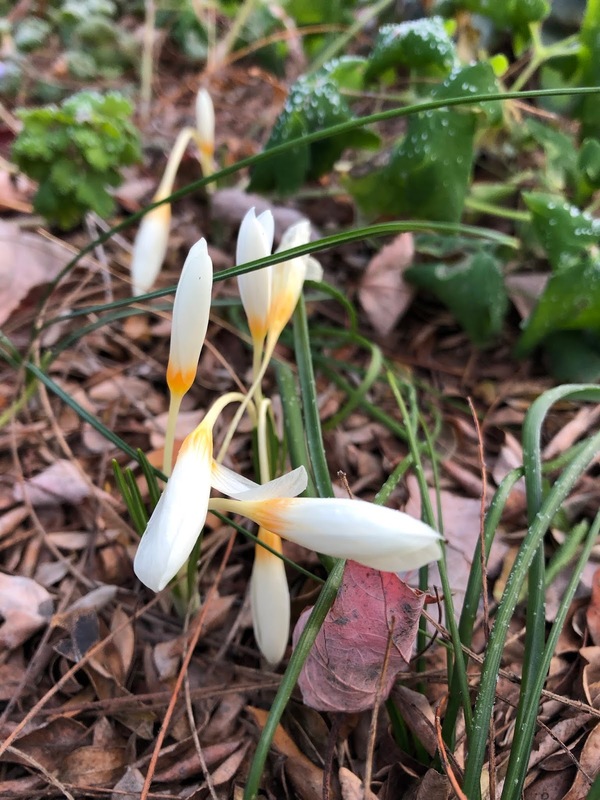 The autumn crocus, Crocus speciosus, feels like the caboose in a long train of blooms through the growing season. Though I have both purple and white autumn crocuses, it is the white crocuses that bloom last. Nearby, I see the first bud of the Christmas Rose, Helleborus niger 'Josef Lemper'. What would we do for winter blooms without the Christmas Rose? We would have to rely on tall sedum for our winter interest. It is pretty tipped in frost. I cannot wait to see it covered by snow. Not really. I kid. I can wait to see it covered by snow. And that is it for November in my garden, unless you also want to count some rosebuds on the 'At Last' roses from Proven Winners, which looked like they missed the train of warm weather and are left shivering at the station in the cold. Or maybe we can count the launch of a new podcast as a new "bloom". Dee Nash of Red Dirt Ramblings and I are collaborating on a podcast. 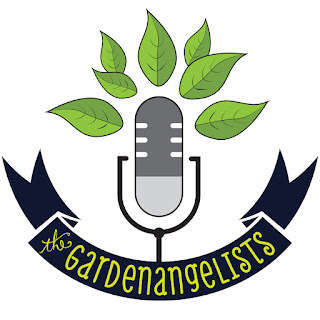 We call ourselves The Gardenangelists and we are sharing about "flowers, veggies and all the best dirt." Click on the link above and subscribe via iTunes if you like what you hear. Feel free to leave a review or send an email with suggestions for future podcasts. And that is it for my garden for November! 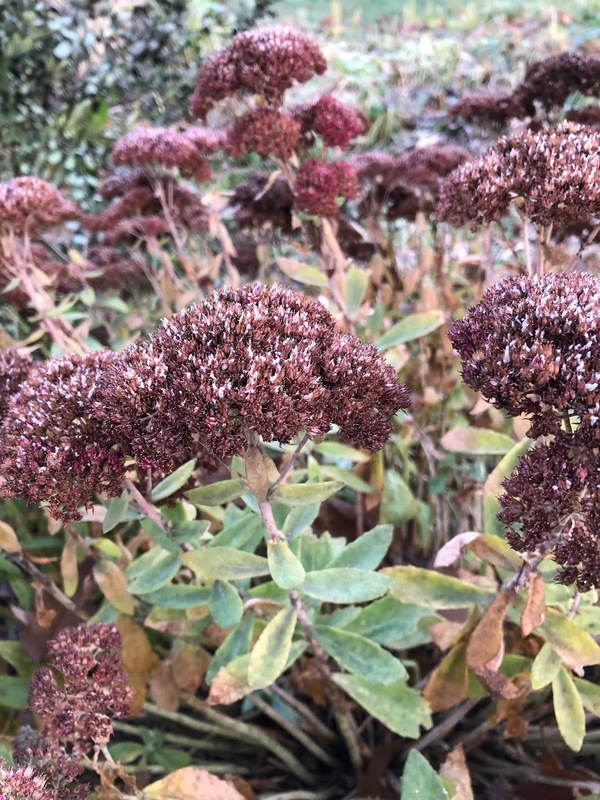 What's blooming in your garden as we end our growing season and head into true winter? We'd love to have you share your blooms with us for Garden Bloggers' Bloom Day. It's easy to participate. 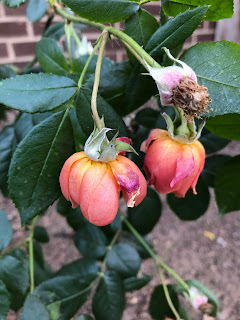 Just post on your blog about the blooms in your garden and then come back here and leave a comment to tell us what you have and a link in the Mr. Linky widget to tell us how to get there. I always feel sad when temperate country bloggers talk about frost and winter as i imagine the fate of the lovely plants. At least here we have continuously green and colorful plants, as long as we want them. The annuals die during the dry season, but they complete the old age and already preserved their species before they totally die. Autumn's hanging on for a bit longer here in the UK, Carol and we still have lots of colourful leaves to admire. It's a good year for yellow! A cold spell is forecast for next week, so our gardens will be joining yours in their winter coat. My post is about the first of those winter flowers in my garden. Happy Blooms Day everyone! We had a short (but beautiful) foliage season. It's all a memory now. If only GBBD had been last Thursday! We are under a winter storm warning and I have a feeling you are under snow by now too. Happy GBBD! We had a wonderfully colourful autumn, but it is almost at an end now. Love your little crocus, winter flowers have to be so tough don't they. How exciting about your new podcast! Can't wait to listen. Less exciting is the thought of a snow-covered garden. However, that nice blanket of white will keep the garden fairies warm as they go about all the underground magic that happens during the winter. Thank goodness for the hellebores! In our region we look forward for winter for great blooms that is impossible in summer ,since our winter is very mild spring blooms generally start showing blooms till January end . I haven't had a chance to give the podcast a listen yet, thanks for the reminder! Snow...ugh. I'm sorry to hear that fall's presence was fleeting and that winter is breathing down your neck. Congratulations on the podcast series! I am so happy to be able to enjoy all these gardens on this rainy day. Please forgive me for being a "post parasite." Someday I will get my act together and share my own garden on bloom day. A podcast? And with Dee? Oh my, that sounds exciting! Do I dare admit that I have never listened to a podcast? Does it come with instructions? Good thing I have teenagers to help me figure these things out. Congrats on your new adventure! I have tried to post my blog for bloom day but not sure it has gone through - I tried several times so there may be many copies - sorry if I goofed things up. Excited about your podcast - fun to have something new to check out. It's a change of season. We do our best. Well I dutifully took flower pictures on Nov 14th to be prepared for posting and then we got slammed with a winter storm on the 15th. After 2 hrs of shoveling snow I was left with posting the next day as usual. Other than this snowstorm it has been a long lingering Fall for us, so hard to complain. We have had a very clement autumn here in Portland, OR. As I write this, I have not yet had a frost, but I live near the Willamette River which helps warm the garden. My summer blooms are trailing into winter as a result, so you'll see some bright bllooms this month. I hope you don't have snow for your garden just yet, Carol! Like you, I took pictures before our 6 inches of snow fell. But no matter--all my blooms were indoors! I think I saw one bud on a hellebore. It may also have been 'Josef Lemper', but it's under snow now. Fall was so short-lived here too. I got all my pictures right before the frost, luckily!